Classic Tabbouleh Salad—a.k.a. 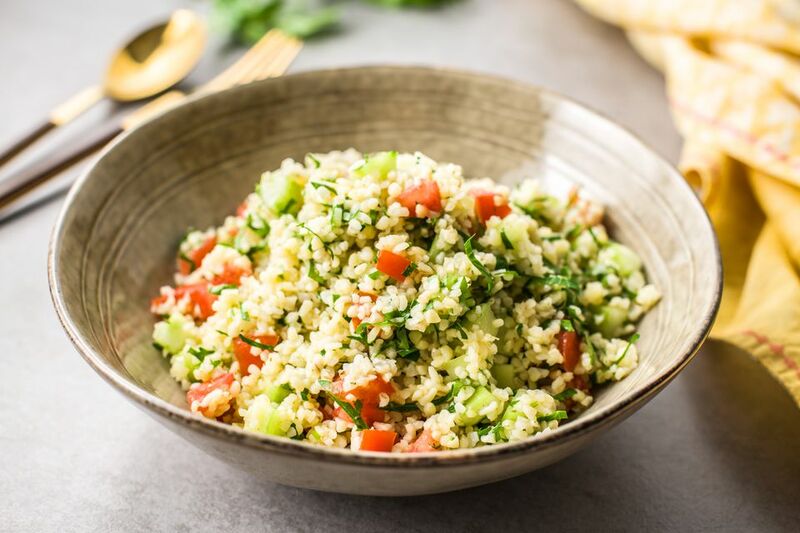 tabouli—is made with cracked wheat bulgur, parsley, tomatoes, and a bright garlic mint dressing. Feel free to play around with the proportions, especially the various vegetables. Example: you can make this with no tomatoes when fresh, ripe ones were not to be had, or throw in much more parsley (we're talking three big bunches) for a greener salad. Put the bulgur in a medium bowl and sprinkle it with 1/2 teaspoon salt. Add 1 1/2 cups boiling water, cover, and let sit 20 minutes. Pick the parsley leaves from the stems; discard the stems or save them for another use. Roughly chop the leaves. Core, seed, and chop the tomatoes. Peel, seed, and chop the cucumber (removing the seeds from the cucumber will keep the final salad from becoming too watery and also mitigates any bitterness than cucumber seeds can have). Place in a large bowl. Check the bulgur. After 20 minutes it should have absorbed all of the water, but there may be a bit in the bottom of the bowl. Taste the bulgur, it should be tender to the bite. If it's not, stir, cover, and let sit 10 more minutes. If it is tender and there's water in the bowl, either drain the bulgur in a fine-mesh sieve or lift it out with a slotted spoon and into a separate bowl. Pour the dressing over the bulgur and toss to combine well. Add the parsley and toss to combine well. Add the tomatoes and cucumber and stir to combine. If you do chill the salad, know that it will taste a bit better and brighter if you let it sit at room temperature for at least 30 minutes before serving to take off some of the chill it will carry from its time in the fridge. An extra tip: if you want to make this salad ahead of time, you can also wait and chop and add the tomatoes at the last minute—time in the fridge is never their friend! Use quinoa instead of bulgur—it's on-trend, packed with protein, and gluten-free. Use couscous instead of bulgur for a lighter texture in the salad. Top with 1/2 cup crumbled feta cheese for a creamy yet salty hit. Stir in a can of drained and rinsed chickpeas. Add 1/3 cup chopped pitted black olives for a deeper flavor.